What does one of the most celebrated film makers of the post-Nouvelle Vague generation have in common with Situationist International’s erstwhile figurehead? One was just thirteen during the uprising of May 1968, while the other is considered one of its driving forces. 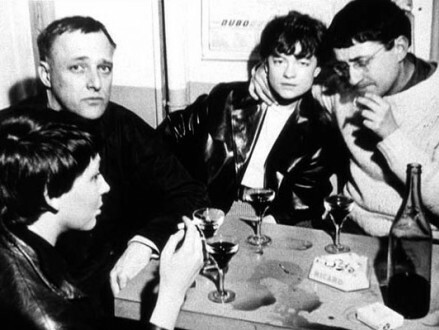 It was not until later, enthused by the echo of this revolutionary experience and the wave of the 70s counter-culture, that Olivier Assayas turned to the work of Guy Debord, which he continues to treasure to this day as “the only place where I have always felt life, resistance and history intact”. About this prominent period, Assayas published in 2005 the booklet Une adolescence dans l’apres mai, which also served as a blueprint for his latest film, Après Mai. Assayas mentions in his text, written as a letter to Debord’s widow, the desperation of his generation, the collapse of the left, the advance of globalisation and mediatisation, the tyranny of a consensus society, and in stark contrast to all of this, Debord’s unremitting poetry of resistance: “he tells us that soon it will be too late. That lost opportunities do not present themselves again. But also that thought can shake up the city. Not only has he said so, he has done so and set an example; so that everyone, deep down, knows that it can be done.” In this first DISSENT ! session, Assayas enters into dialogue with art historian Eric de Bruyn, about Debord’s lasting influence, not least in the shape of his films, which Assayas managed to rescue from obscurity a few years ago. What contemporary resonance does Debord’s work have? And how can his films inspire a cinema about, and of, today? Preceded by a screening of Sur le passage de quelques personnes à travers une assez courte unité de temps. Eric C.H. de Bruyn is an assistant professor of film and photographic studies at the University of Leiden, The Netherlands. He is an editor of Grey Room and has published, among other places, in Artforum, Texte zur Kunst, and Art Journal. This past spring he organized with Sven Lütticken, “Séances: Performing Film,” a series of screenings that took place at MUMOK in Vienna. Cinematek is also organizing a retrospective of Olivier Assayas’ work 1 – 21 November. The full programme is available on www.cinematek.be. With the support of Hogeschool Sint-Lukas Brussels (LUCA). Also read ‘In eternal circumstances from the depths of a shipwreck‘ by Assayas, and two interviews on Guy Debord, as well as Jacques Rancière’s ‘When we were on the Shenandoa‘.